The SdKfz 6 (Sonderkraftfahrzeug 6) was a half-track military vehicle used by the German Wehrmacht during the Second World War. It was designed to be used as the main towing vehicle for the 10.5 cm leFH 18 howitzer. However it proved far too expensive and was phased out in 1941 for more economic halftracks. 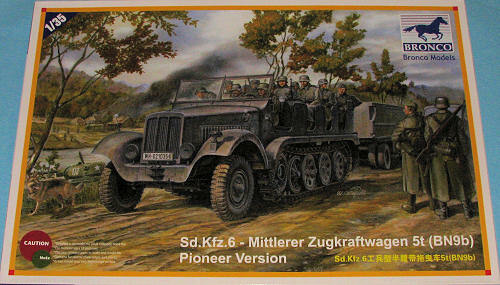 Existing SdKfz 6's were maintained in the German army afterwards. Standard half-tracked vehicle, used for towing various artillery pieces and transporting anything up to fifteen people. SdKfz 6 fitted with a 3.7 cm FlaK 36 gun, sides would fold down to allow space to work on. Crew of seven. SdKfz 6 fitted with a captured Soviet 76-mm divisional gun model 1936 (F-22). This is another of Bronco's well detailed military vehicle kits. 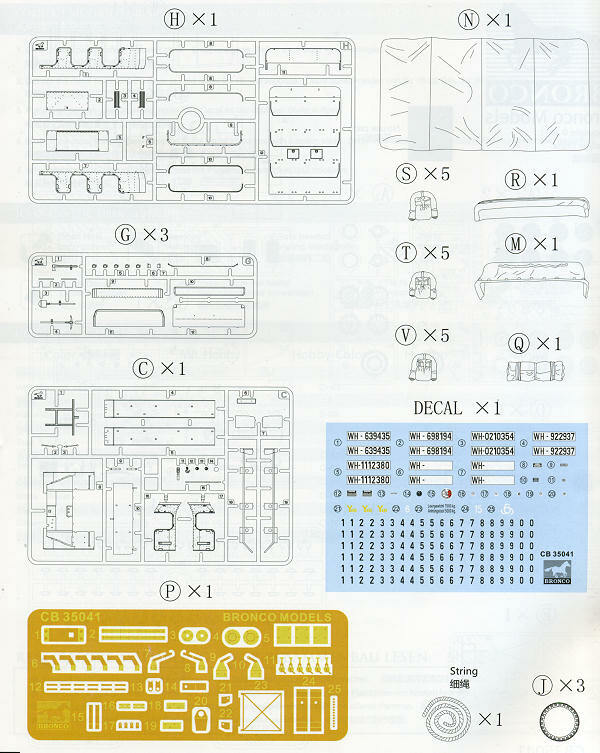 As you can see, there are a lot of parts, not all of which are used on this particular kit. There is a photo etch fret included for some of the very fine detail parts which will be fit on various places throughout the kit, such as the fuel tank brackets, windscreen handles, fender attachment areas and things like that. The kit can be built as either an early or late variant so you will need to keep in mind which one you are doing during construction. There is really little different between the two, but it is nice to have that option. With a fully detailed engine, transmissions, suspension and winch (for which you have string for the cable), this is not a curbside. Easily half of the construction is for this part of the kit. The individual track links add to the level of realism. Not only are the track links separate, but so are the track pads. Now this is a troop transport as much as a towing vehicle and so you have to have room to store all their equipment. Fifteen sets of rifles and rifle storage racks are included with the other tools such as picks and shovels. Ammunition and helmets are also in the mix. Some of the options are for an open or closed hood, a windscreen that can be folded down if desired as well as a rear compartment that can be built open or closed. 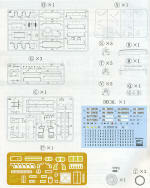 The kit also has the ability to be built with the top up or down. For the down position, there are the separate top hoops to be assembled. Tires are separate from the wheels, to help make painting easier. I like this option on kits and wish more did it. Bronco has some of the best instructions in the market and this set is no exception. The construction sections are superbly drawn and not at all crowded together as one sees with some others. This makes the build go smoother, in my opinion. Color information is supplied where needed using a variety of paint company options. There are markings for five vehicles, though you could easily do any one for which you have a photo. Most are in Panzer Grey and from unidentified units. The one identified is in Panzer Yellow with the 21st Panzer Division in Libya during 1942. As mentioned, the decal sheet has license plates for the five markings options as well as a blank plate and a variety of letters and numbers. Instruments are also on this sheet. 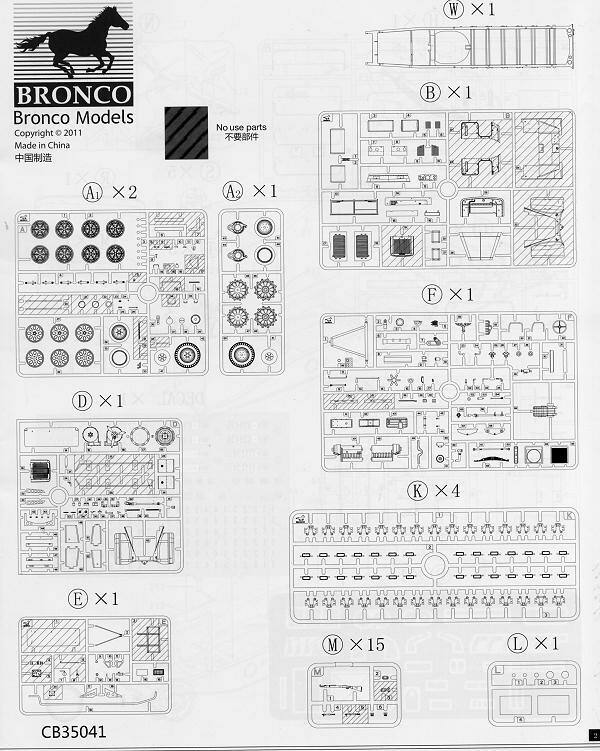 It all makes for another superbly detailed Bronco kit. About all that is missing are figures, however, there is a set of 'halftrack riders' out there to be used for this kit. Now you have a great kit of this somewhat lesser known prime mover, ready to be hitched up to your favorite field gun. Thanks t0 www.dragonmodelsusa.com for the preview kit. Get yours today at your local retailer.